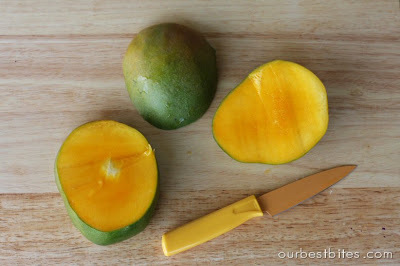 We frequently get questions about mangoes; especially how to cut them, so here’s the scoop. Mangoes that you find in American grocery stores usually come from places like Mexico, Peru, Brazil, or The Philippines. Although they can be different varieties you’ll find most of them look alike and follow similar ripening patterns. The skins can be a mixture of greens, yellows, oranges and reds. For a lot of mango varieties, the rule applies: the greener the mango, the less ripe it is. As it ripens it turns shades of red and yellow, and gets softer. BUT, that is not always the case. Many mangoes have a natural yellow or green color, when both ripe and not ripe, so color shouldn’t be your best indicator, it should be how it feels. You want to find one that’s firm, but still soft to the touch. It’s similar to how an avocado feels. 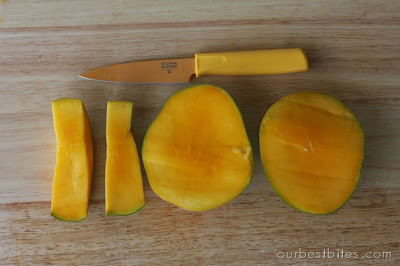 Mangoes have a big seed in the middle, so you have to cut around it. They’re also super slippery when peeled, so you’ll find it easiest to cut first, peel second. 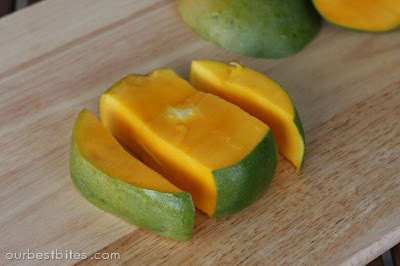 Mangoes are oval shaped, so you’re going to cut off 2 “wide” sides, and then 2 “narrow” sides. Hold the mango upright, it should be longer top to bottom than it is side to side, like in the left-hand side picture below. Start with a sharp paring knife at the top. Cut downward down one of the wide sides until you feel the seed. Just cut down the side, feeling the seed with your knife and cutting right around it. Do the same with the opposite side. This is the majority of the fruit. You’ll now be left with the two narrow sides, so just cut around the seed to get those off too. You’ll now be left with these parts: 2 wide pieces, and 2 narrow ones, and the seed. Before you toss that seed, make sure to lean over the sink and slurp off all that juicy fruit. That’s the best part of this whole experience. Yes, it’s an experience. You can actually slice the large pieces while still in the skin and scoop them out like you would an avocado. Or you can dice them the same way, and just flip the skin inside-out so all the chunks pop out. The majority of the time I prefer to slice the large halves into 3 or 4 strips, peel the skin off with a knife, and then chop into chunks. Here’s a video demonstrating the whole process! Mangoes are a really versatile food because they’re good in both sweet and savory dishes. I love them on the grill, paired with chicken or steak, or in smoothies, on top of yogurt, chopped in a fruit salad, or even in salsa. They’re great in ice cream and sorbets, and in lots of other desserts. Of course one of the very best ways to eat a mango? Plain! Mmmmm that looks so yummy!And I must say… what a beautiful set of hands cutting that mango… wherever did you find such a model? I’ve recently discovered that I love mangoes, after years of dispising them. 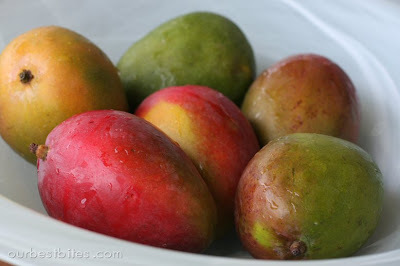 My love came when I discovered that for Weight Watchers – they are only 2 points for a whole mango! We will definitely be trying the sorbet, my husband will love it! Stephanie, I used to not like them either; or maybe I was just indifferent because I didn’t really eat them on a regular basis. Now it’s seriously one of my favorite foods! I have always been a fan of the dried Phillipines mangos from costco, but this week I ventured out and bought a fresh one. It was divine! Now I’ve bought a box of them from costco. Thanks for explaining about them! Where were you when I was butchering my mango two days ago? Thanks for the tips for next time. 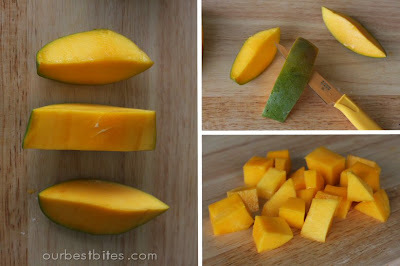 Exactly how I cut my mangos…. My daughter and I LOVE them… so tasty and yes, I never miss the experience of the seed when I cut them. It's the reward of being the mango preparer! have you tried the mango slicer from OXO! love it. Makes it a snap when cutting a mango! 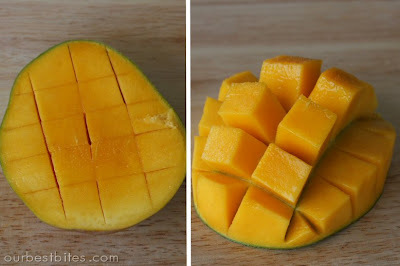 I just found your blog and was excited to find this post since I can never cut a mango right! Thanks!! 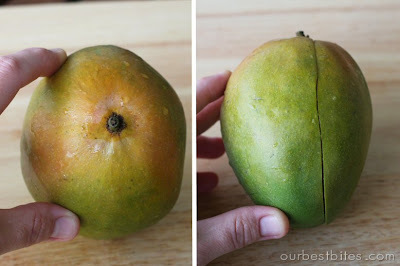 When I lived in Thailand they showed me an easy way to peel mangoes. Cut in half and get a cup(preferably glass) and slide it right next to the peel and it slides through smoothly while sending the mango into the cup. Then it’s all ready to eat or cut into chunks. Wow, this was timely:-) i just ran across this link in your latest email, and am grateful for it! I’ve been mangling the poor mangoes I got from the store this week… for some reason I’ve never bought them fresh before, but my kiddos love them! Thank you!